Once graduated in Biological Chemistry I dedicated myself to University research. This scientific preparation was later an invaluable store of knowledge in the setting up of the sheepdog kennels. After accurate and patient work it seemed right to collect all my experiences in a book to them dedicated. 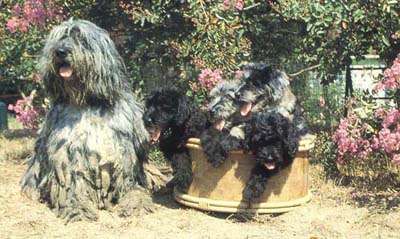 So was written THE BERGAMASCO, ALPINE SHEEPDOG, first in an Italian edition, then in an English one, so to permit to a larger number of dog-fanciers to know the breed. It's a complete and detailed study, never dealt with before, in which, anyone interested in the breed can find full satisfaction in his/her desire of knowledge. GENETICS AND THE DOG (LA GENETICA E IL CANE) is the result of a patient and careful study on the genetic problems breeders have to face in their work. I was able so to determine the genetic information of this breed, which had up to then been bred with disorganized and empirical methods. It is thanks to all these efforts that I succeeded to endow my dogs over the years with the same quality and features. These achievements are evidenced by the over 500 dogs born in the Albera Kennel by 2005. The final aim is to further divulge this breed so as to give it its right place among the best known and diffused breeds.